The Reverend Charlotte H. LaForest grew up in Jacksonville, Florida and studied at Georgetown before moving to Massachusetts to begin graduate school in social work and pastoral ministry at Boston College. She graduated in 2015 with a Masters in Divinity and Diploma in Anglican Studies from Yale Divinity School and the Berkeley Divinity School at Yale. 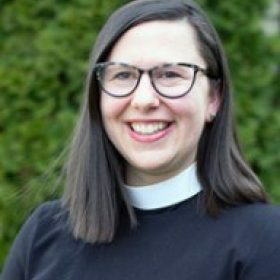 Before coming to St. James's in 2018, Charlotte served for three years as Assistant Rector for St. John's Episcopal Church in Essex, CT, where she focused on pastoral care, spiritual formation, and intergenerational ministry. She and her husband, Eric, share a home with their three children and eight-year old Spinone Italiano, Whitman.